This feature allows you to check your email from any PC with an Internet connection from anywhere in the world. Unlike an email program, this requires no settings before it can be utilised. *Please make sure that you do not save the password when working from an Internet cafe or other publicly accessible computers. Replace “example.co.za” with your actual domain name. 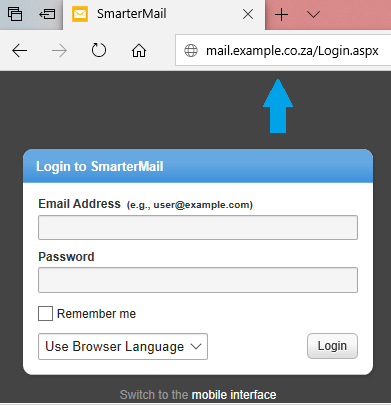 Insert your email address and its password so that you are able to log in.